School trips to the nation’s capital cram in as much as they can, creating a strange mix of history, politics, and ideas to process in a short time. 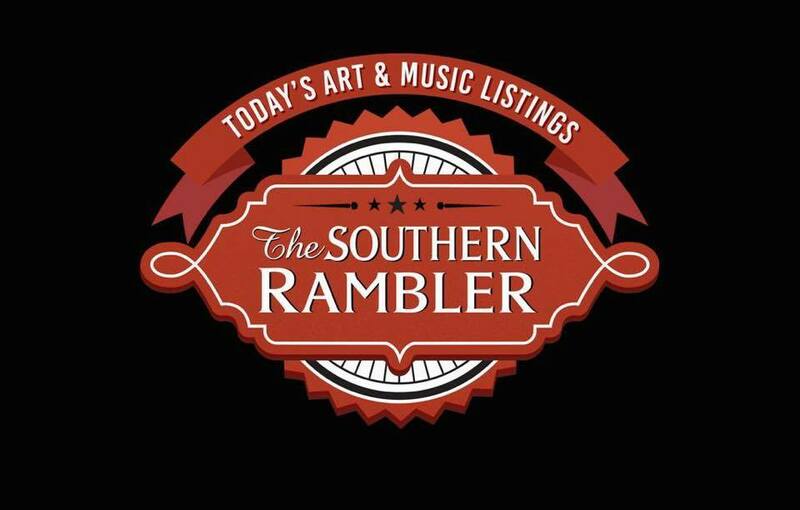 Stories and history told by rangers, videos, pictures, and signs. 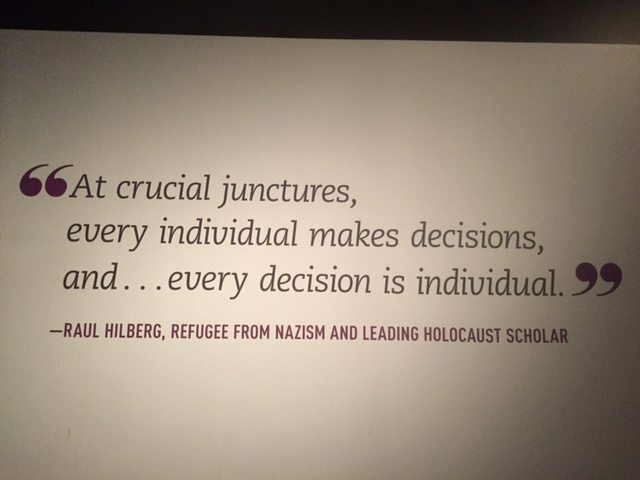 In two hours, we went from the death of Lincoln at Ford’s Theatre to the death of 6 million Jews, including 1.5 million children, in exhibits at the National Holocaust Museum. From Lincoln’s plan of mercy for the South to Hitler’s rise to power after the punishment of Germany following World War 1. A president who grieved over the deaths of soldiers killed in a civil war to a dictator who tried to kill off the Jewish race, as well as people with disabilities and homosexuals. One of the most beloved leaders in history to the most hated. It was a lot to absorb in one morning. 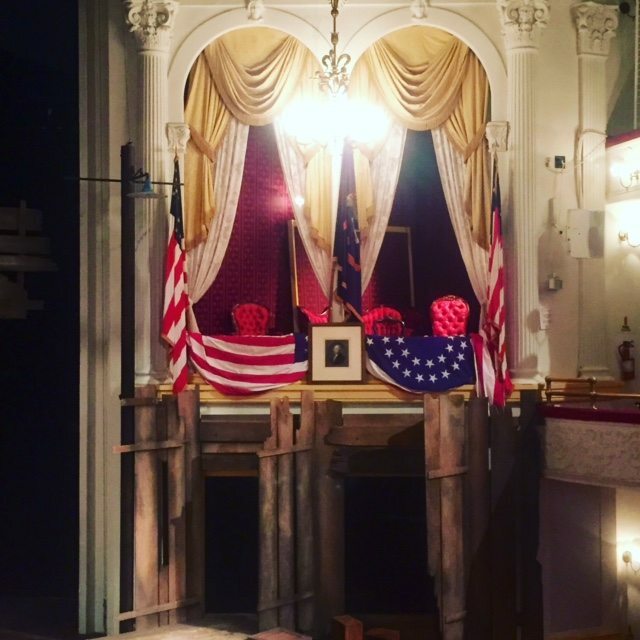 President Lincoln’s booth at the Ford Theatre. Lincoln was assassinated here on April 14, 1865. Ford’s Theatre, originally a Baptist church, was Lincoln’s favorite place to get away from the stress of war for a few hours. Eighteen-Sixty Three had been a bad year with bloody battles and a casualty count in the hundreds of thousands. He finally found a general who could end the war and unite the country, Ulysses S. Grant, and made him commander of Union forces and things began to shift victories to the North. In 1864, Lincoln gave an inaugural address of sadness, healing and unification. He wanted to stop the anger and bitterness. John Wilkes Booth was an actor from an acting family and would never have the fame of his brother and dad, but he had an idea that would make him a more famous actor – kill Lincoln. Everything was Lincoln’s fault and Lincoln must die. 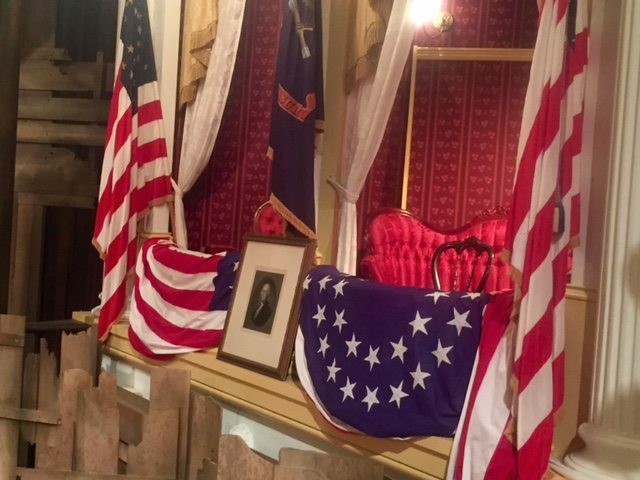 Booth had acted at Ford’s Theater in other plays and the Commander in Chief liked his work. Our American Cousin, a 19th century comedy, was playing at the theater on April 14, 1865, and Booth knew the line in the 3rd act that would make the audience laugh. That was the time to take the shot. Lincoln had spent the day with his family. He hadn’t had many chances to do that, but he was beginning to relax and see the country coming together. It was five days after Confederate Gen. Robert E. Lee surrendered his army to Grant at Appomattox Court House, Virginia, effectively ending the American Civil War. Lincoln and his wife Mary arrived late, and the 6-foot-four president tried to sneak in. The actress recognized him and stopped the show. The band played “Hail to the Chief” to much applause. There was no body-guard that night and Booth entered the box and shot Lincoln with a single-shot pistol. The bullet entered left side of his skull, over the ear. Booth leapt onto the stage and shouted, “Sic semper tyrannis!,” a line from Julius Ceasar. He broke his leg in the fall, but dashed off on a horse. They carried Lincoln out of the theater and took him to the back bedroom of the Peterson house across the street. There was a vigil outside and the great commander died the next day. Lincoln’s plan of peaceful unification died with him. Compassion for people who couldn’t speak for themselves and compassion for the defeated were replaced with punishment for the South. The Gettysburg Address is on a wall in the Lincoln Memorial. A speech he gave to honor the soldiers killed is an eternal reminder that their deaths should not be in vain. 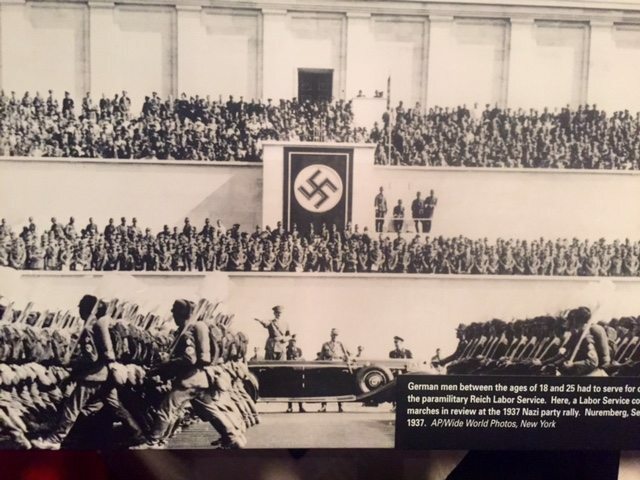 Almost 70 years after Lincoln’s assassination, Hitler was appointed chancellor of Germany in the summer of 1933 and a video at The United States Holocaust Memorial Museum explains how a once unknown corporal in the German army convinced a country to turn against people who had been their neighbors and blame them for their country’s misery. The penalties, punishments and a depression at the end of World War I brought civil war in Germany and the country felt stabbed in the back by the unpopular Versailles Treaty. Money was worthless. Germany’s children were starving and the economic crisis led to demonstration against capitalism. Hitler, imprisoned for five years for a failed coup, wrote Mein Kampf from his cell about a future without Jews. His ideals provided identity and an outlet for frustrated people. They were comforted and encouraged by Hitler’s propaganda promising bread and work and a Germany restored to greatness. Hitler was appointed Chancellor because the political parties thought he could be controlled and he would be more moderate in power. They were wrong and Hitler banned the opposition parties on his rise to dictator. Through his ascension in Germany and the first few years of World War II, no one could stop him and he seemed invincible until the United States entered the war. Hitler committed suicide and Germany lost, but the anger and racism that boiled over 80 years ago was not a one-time event in a distant past. Genocide still happens around the world today. 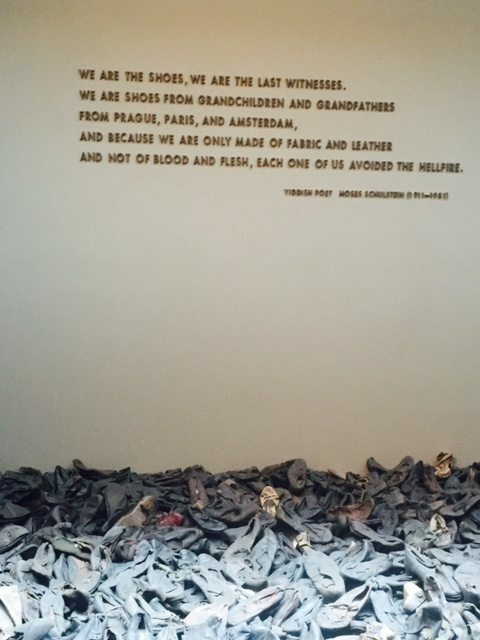 The United States Holocaust Memorial Museum is a reminder of what happens when desperation and hatred fuel a fire. It also gives faces, names and stories to the victims. Many were stripped of their identity and became the number tattooed on their left arm. In the 12 years of rule, the Nazis established more than 42,000 ghettos, concentration camps and killing centers. 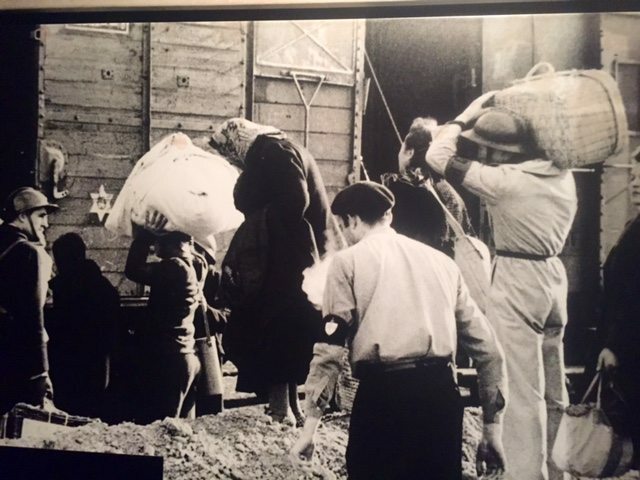 Museum pictures show Jews in ghettos, boarding box cars for concentration camps, and rows of thousands of prisoners standing for roll call in a concentration camp. Pictures of shaved hair sold to firms which used it to make felt slippers, bumpers for boats and stuffing for mattresses. 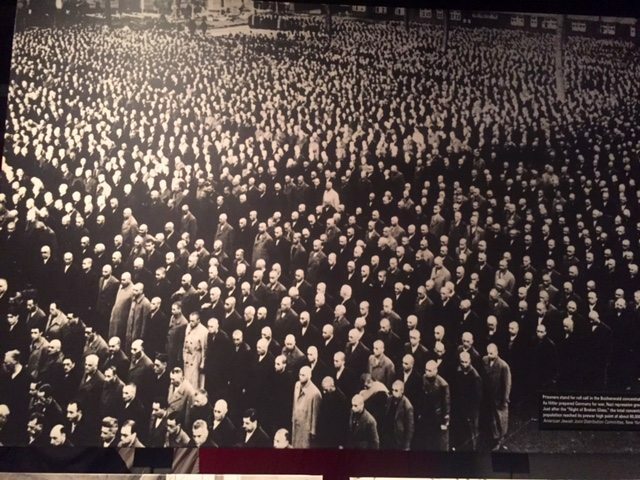 Emaciated bodies crammed into bunks, and piles of bodies after they have been exterminated by killing squads or carbon monoxide (the Nazis began using gas to kill hospital patients with disabilities and the gas chamber euthanasia grew from there). In a few words and lines, poems on the wall tell the pain of the victims. Slowly I feel myself turning grey. I am each old man here, shot dead. I am every child here, shot dead. Nothing in me shall ever forget! Silent scream. Soundless scream. The poem is about the biggest single massacre of the Holocaust when in two days the Nazis took almost 34,000 Jews to the edge of the Babi Yar ravine in the Ukraine and shot them all. Before they were shot, they were forced to hand over their valuables and remove their clothes. During the following months, 100,000 may have been killed in the ravine at Babi Yar. 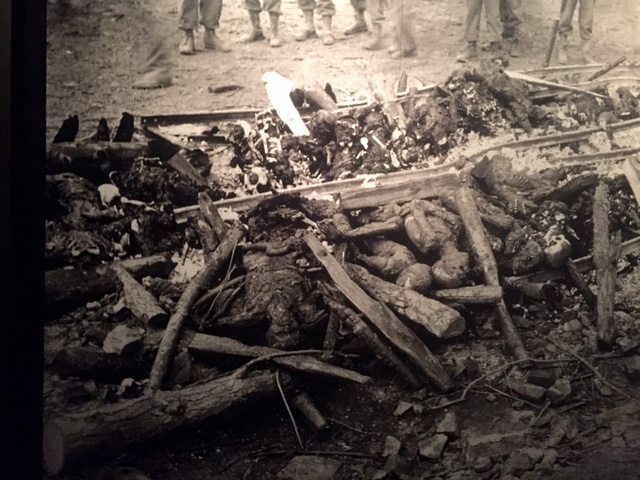 The belongings removed before extermination were often confiscated. 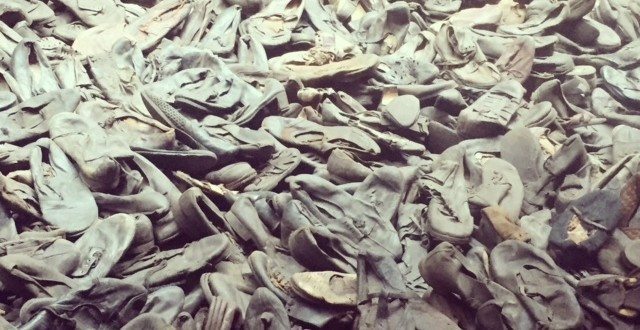 There were hundreds of thousands of pairs of shoes left behind and the best were sent to German settlers in Poland. Heels, sandals, boots, and leather dress shoes. Shoes with ties and straps. Shoes of children and grandparents. They are grey and deteriorating and smell of rubber, but are now a reminder of the people who purchased and wore them during a time of normal life. And why each shoe was removed for the last time. Are not of Blood and Flesh, each one of us avoided the Hellfire. 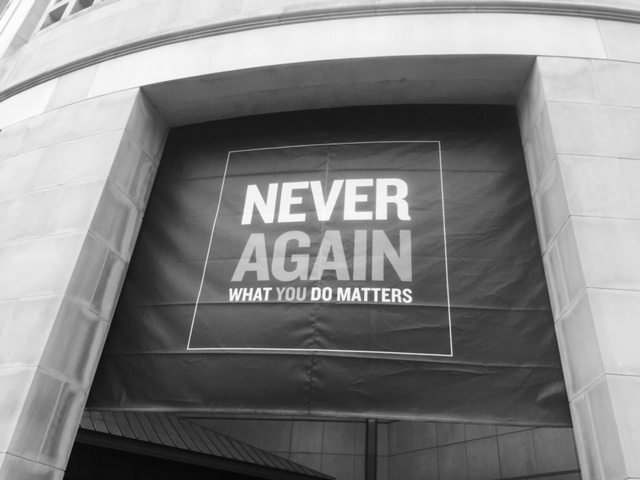 Signs outside the museum say “Never Again. 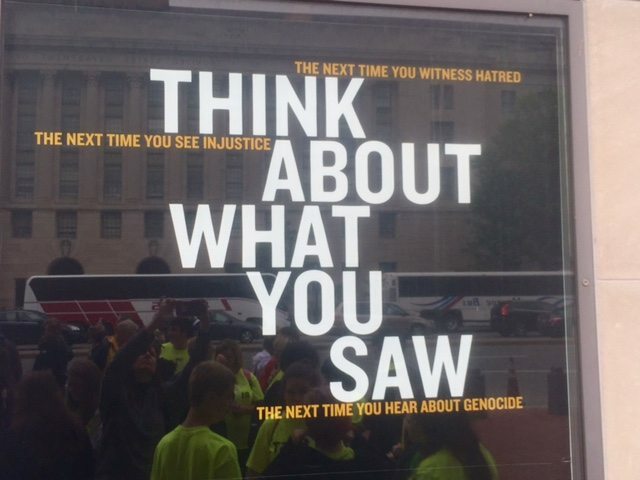 What You Do Matters” and “Think About What You Saw The Next Time You Witness Hatred/The Next Time You See Injustice.” Survivors volunteer at the museum to tell their stories. 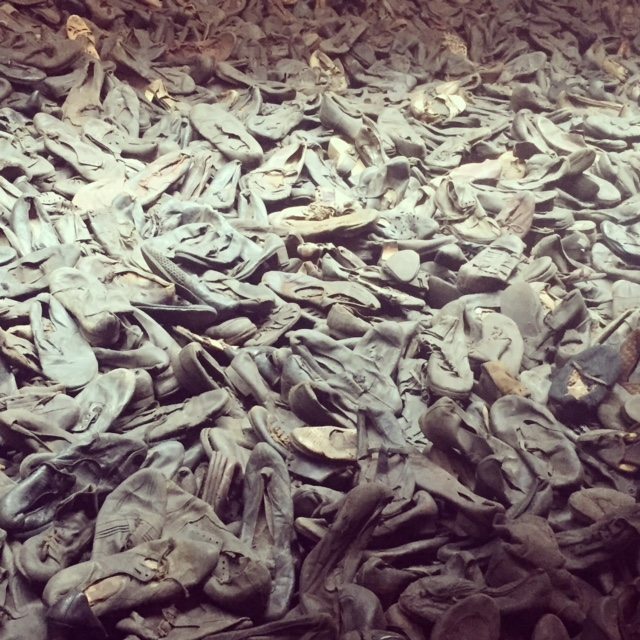 They know that one day there will be no more survivors and museums and stories will be the only way the world remembers the Holocaust. “I want the next generations to see what we went through and know it really happened so it won’t happen again,” a survivor said. Lessons of Lincoln and Hitler. One of peace, freedom and reconciliation and the other of hatred, power and extermination. Both forever needing remembrance. Powerful words and imagery. My God. Those shoes.